Elizabeth Branwell was born at Penzance in Cornwall, elder sister of Maria Branwell. She brought the Bronte children up after their mother Maria Branwell (Bronte) died. Patrick Bronte was born at Emdale, Drumballyroney, County Down, Ireland. Maria Branwell was born at Penzance, Cornwall. Patrick Bronte aged 25 registered as a student at St John's College Cambridge. Patrick Bronte a student at St Johns College Cambridge, changed the spelling of his name from Brunty to Bronte. Patrick Bronte conducted his last parish duty at St Mary Magdalene Church, of Wethersfield in Essex, performing a burial. He had taken the post of curate in the autumn of 1806. Elizabeth Gaskell who wrote the Life of Charlotte Bronte was born. Patrick Bronte and Maria Branwell were married at Guiseley Church. Elizabeth Bronte, second child of the Bronte family was born at Hartshead. The Bronte family moved to the Parsonage at Market Street, Thornton, Bradford. Elizabeth Bronte second child of the Bronte family was baptised at Thornton. Charlotte Bronte, third child of the Bronte family was born at Thornton. Charlotte Bronte third child of the Bronte family was baptised at Thornton. Mary Taylor close friend of Charlotte Bronte was born. Patrick Branwell Bronte fourth child of the Bronte family was born at Thornton. Emily Jane Bronte, fifth child of the Bronte family was born at Thornton. Emily Jane Bronte, fifth child of the Bronte family was baptised. Arthur Bell Nicholls was born at Killhead, County Antrim, Ireland. He was Charlotte Bronte’s husband. The resignation of the Revd. Samuel Redhead from the Perpetual Curacy of Haworth was officially recorded by the Bradford Parish Clerk. Anne Bronte, sixth child of the Bronte family was born at Thornton. Patrick Bronte was granted perpetual curacy of Haworth. Anne Bronte sixth child of the Bronte family was baptised at Thornton. The Bronte family moved from Thornton to Haworth Parsonage. The procession of seven carts and one covered wagon led up the Main St (then known as Kirkgate) finishing at Parsonage Lane (now Church St). Maria Bronte wife of Patrick Bronte was diagnosed with cancer. Maria Bronte wife of Patrick Bronte died at Haworth aged 38. Maria Bronte wife of Patrick Bronte, was buried in the family vault at Haworth Parish Church. She had died on 15th September aged 38. "My dear wife was taken dangerously ill on the 29th of January last; and in a little more than seven months afterwards she died. During every week and almost every day of this long tedious interval I expected her final removal. I was left quite alone, unless you suppose my six little children and the nurse and servants to have been company." Patrick Bronte wrote to Mary Burder's mother in Wethersfield, Essex, explaining the past 14 years of his life, and asking of her family. His wife Maria had died in 1821, he had met Mary Burder when he was curate of St Mary Magdalene Church in Essex from 1806 - 1809. Patrick with six young children was finding it hard to cope on his own. The eldest Bronte girls, Maria and Elizabeth were sent to the Clergy Daughters School at Cowan Bridge. Charlotte Bronte was sent to the Clergy Daughters School at Cowan Bridge. Emily Bronte was sent to the Clergy Daughters School at Cowan Bridge. Maria Bronte first child of the Bronte family died at Haworth of consumption. She was 12 years old. The Bronte sisters left the Clergy Daughters School at Cowan Bridge; the conditions there were described as disgusting and filthy. Elizabeth Bronte died at Haworth aged 10 years. Elizabeth Bronte aged 10 was buried at Haworth. She had died on 15th June. Timothy Feather was baptised by Patrick Bronte. He became known as the last Hand-loom Weaver and lived all his life at Stanbury. Patrick Bronte returned from Leeds and gave a box of toy soldiers to Branwell. Martha Brown who was a servant to the Bronte household was born. "I am in the Kitchen of the Parsonage house Haworth. Tabby the servant is washing up after breakfast and Anne my youngest sister is kneeling on a chair looking at some cakes which Tabby has been baking for us. Emily is in the parlour brushing it, papa and Branwell are gone to Keighley. Aunt is up stairs in her room and I am sitting by the table writing this in the kitchen." Charlotte Bronte - The History of the Year. A watercolour still life of wild roses was painted by Charlotte Bronte 'from Nature'. Charlotte Bronte wrote her poem "Morning". Aunt Branwell who brought the Bronte children up made her will. The money helped finance Charlotte, Emily and Anne's early publications. "I fed Rainbow, Diamond, Snowflake Jasper pheasent alias this morning. Branwell went down to Mr Drivers and brought news that Sir Robert Peel was going to be invited to stand for Leeds. Anne and I have been peeling apples for Charlotte to make an apple pudding.....Taby said just now come Anne pillopatate..."
Charlotte Bronte went as teacher to Miss Wooler's school Roe Head. Emily accompanied her as a pupil. Branwell Bronte was proposed a Freemason. Branwell Bronte became a full member of the Three Graces Lodge in Haworth. Meeting held in the Sunday School rooms and chaired by Patrick Bronte to repeal the Poor Law Amendment Act of 1834. Charlotte Bronte received a letter from Robert Southey - The Poet Laureate: "Literature cannot be the business of a woman's life: & it ought not to be." Emily Bronte wrote her poem "O God of Heaven! The dream of horror". Branwell Bronte wrote his poem "At dead of midnight drearily". A little while I've holyday!" Emily Bronte wrote her poem "The Bluebell". Emily Bronte wrote the poem "The night was dark yet winter breathed...."
Charlotte Bronte wrote her poem "Life". Anne Bronte became governess for the Ingham family at Blake Hall Mirfield. Emily Bronte wrote her poem "And now the house-dog stretched once more". Emily Bronte wrote the poem "The organ swells the trumpets sound". Emily Bronte wrote the poem "Well, some may hate, and some may scorn, And some may quite forget thy name...". Emily Bronte wrote the poem "Thy son is near meridian height, and my sun sinks in endless night...". William Weightman who was Patrick Brontes curate sent Valentines to the three Bronte sisters, the first they had ever received. Branwell Bronte was appointed Assistant Clerk at Sowerby Bridge Railway Station near Halifax. His starting salary was £75 a year. Emily Bronte wrote her poem "Riches I hold in light esteem and Love I laugh to scorn...". Charlotte Bronte became a governess for the White family who lived at Upperwood House, Rawdon, near Bradford. Branwell Bronte was employed as Clerk in Charge of Luddenden Foot station near Hebden Bridge. While there he was known to frequent the Lord Nelson Tavern. Emily Bronte wrote her poem "Aye, there it is! It wakes tonight". Charlotte Bronte wrote her poem "Passion". Charlotte and Emily Bronte began their journey to Brussels to stay at the Pensionnat Heger, a finishing school run by the Heger family. Patrick Bronte travelled with them on the journey. Branwell Bronte was dismissed from his post as Clerk in charge of Luddenden Foot station near Hebden Bridge. There was a deficit in the station accounts attributed to Branwell Bronte's incompetence rather than theft. William Weightman, Patrick Bronte's curate performed his last duty at Haworth. He had been visiting the sick and was taken ill with cholera, he died on 6th September 1842. William Weightman aged 26, who was Patrick Brontes curate died of cholera, the disease was prevalent in Haworth at the time. "He was three years curate of Haworth and by the Congregation and Parishioners in general was greatly respected for his orthodox principles, active zeal, moral habits, learning, mildness and affability. His useful labours will long be gratefully remembered by the members of the Congregation and Sunday School Teachers and Scholars." William Weightman who was Patrick Brontes curate was buried. He had died of cholera on 6th September, the disease was prevalent in Haworth at the time. A Memorial service was given by Patrick Bronte in memory of William Weightman who had died of cholera on 6th September. Patrick Bronte had loved him as a son. Elizabeth Branwell, Aunt to the Bronte children who brought them up, died aged 66. Elizabeth Branwell, Aunt to the Bronte children who brought them up, was buried at Haworth. She had died aged 66 on 29th October. Anne Bronte wrote her poem "To Cowper". Branwell Bronte attended his last meeting as Mason of the Three Graces Lodge in Haworth. Branwell Bronte wrote his poem "Thorpe Green". Charlotte Bronte's tutor M. Heger presented her with a wood fragment from Napoleon's coffin. Patrick Bronte wrote to the Church trustees about the rumour in Haworth village regarding the lotion he was using for his weak eyesight. Gossip had circulated that the smell was similar to alcohol. Anne Bronte wrote her poem "The Captive Dove". Charlotte Bronte received a Diploma from the Pensionnat at Brussels. Charlotte Bronte left the Penssionat at Brussels for home. While studying there she had received a Diploma. Charlotte Bronte arrived back home at Haworth Parsonage, she had been studying at the Heger's Pensionnat at Brussels. Emily Bronte wrote her poem "The Wanderer from the Fold". Emily Bronte wrote a poem "The linnet in the rocky dells, The moor-lark in the air...". Anne and Branwell Bronte returned to their employment as tutors for the Robinson family at Thorp Green. Emily Bronte wrote her poem "The Philosopher". Emily Bronte wrote her poem "Remembrance". Emily Bronte wrote her poem "Death". Emily Bronte wrote the poem Stars: "....All through the night, your glorious eyes were gazing down in mine,..."
The Reverend Arthur Bell Nicholls aged 26 was appointed Curate at Haworth with a salary of £100 per annum. He married Charlotte Bronte in 1854. Anne Bronte wrote her poem "If this be all". Branwell Bronte returned to his employment as tutor with the Robinson family at Thorp Green. While there he had an affair with Mrs Robinson. Branwell Bronte was dismissed from his post as tutor for the Robinson family at Thorp Green. It had been discovered that while there, he had an affair with Mrs Robinson. Emily Bronte wrote her poem "No coward soul is mine, No trembler in the world's storm-troubled sphere...". Emily Bronte wrote the poem, "No coward soul is mine No trembler in the world's storm-troubled sphere...". Charlotte Bronte sent a manuscript of poems to Messrs. Aylott and Jones publishers. They used the pseudonym of Acton, Currer and Ellis Bell. "C.E & A Bell are now preparing for the Press a work of fiction - consisting of three distinct and unconnected tales which may be published together as a work of 3 vols. of ordinary novel-size, or separately as single vols - as shall be deemed most advisable." Branwell Bronte visited the Halifax Guardian and placed an advert for a post that would take him abroad. First printed copies of the Book of "Poems" by Charlotte, Emily and Anne Bronte arrived at the Parsonage. They had used the pseudonym of Acton, Currer and Ellis Bell. Mrs Robinson's husband died, she had a relationship with Branwell Bronte and news of the death gave Branwell hope of marriage. The published Bronte Poems using the pseudonym of Acton, Currer and Ellis Bell received favourable criticism. Only two copies were sold. Surgeons performed an operation on Patrick Bronte's cataracts at Manchester. The operation was successful and after a month convalescing he was able to read again. Emily Bronte wrote the poem “Why ask to know the date – the clime?”. Branwell Bronte through heavy drinking had incurred debts. Officers charged him to pay the debt off or go to prison. The Bronte family had to bail him out. "I hope you are not frozen up; the cold here is dreadful. I do not remember such a series of North-Pole days. England might really have taken a slide up into the Arctic Zone; the sky looks like ice; the earth is frozen; the wind is as keen as a two-edged blade." Music On Christmas Morning - Poem by Anne Bronte, published in the 1846 collection Poems By Currer, Ellis and Acton Bell under Anne's nom de plume 'Acton Bell'. The manuscripts of Emily Bronte's Wuthering Heights and Anne's Agnes Grey were sent to the publishers; T.C. Newby. They were published in December 1847. Charlotte Bronte sent the manuscript of the "Professor" to the publisher Smith, Elder and Co. Cornhill. It was not published. Charlotte Bronte's manuscript of Jane Eyre was sent to the publisher Smith, Elder and Co. Cornhill. Charlotte Bronte's novel Jane Eyre was published under the pseudonym Currer Bell. Charlotte Bronte received copies of her published novel "Jane Eyre". Charlotte Bronte received payment for her novel Jane Eyre which was published on 16th October 1847. Emily and Anne received six published copies of their novels, Wuthering Heights and Agnes Grey from their publishers. Charlotte and Anne Bronte visited London to meet their publisher and revealed their true identity. The Bronte sisters had been using the pseudonyms Acton Currer and Bell. Anne Bronte finished the preface to the second edition of her novel the Tenant of Wildfell Hall. Branwell Bronte was buried in the family vault at Haworth Parish Church. He had died on 24th September aged 31. The service was conducted by William Morgan. Emily Brontes health was poor. Charlotte Bronte wrote of her sister having difficulty breathing and pains in her chest. Emily Bronte died at 2 o'clock in the afternoon. She was 30 years old. Emily Bronte was buried in the family vault at Haworth Parish Church. She had died on 19th December aged 30. Anne Bronte caught influenza, consumption was diagnosed in both lungs. Charlotte and Anne Bronte went to Scarborough with Ellen Nussey. Anne’s health was declining. Anne Bronte died at 2 o'clock in the afternoon aged 29 at Scarborough. Anne Bronte was buried at St Mary's churchyard Castle Hill Scarborough. She had died on 28th May aged 29. The lack of fresh water in Haworth was a concern. Patrick Bronte had prepared a petition which was sent to the General Board of Health in London in an effort to improve sanitation. Charlotte Bronte completed her novel Shirley. Patrick Bronte sent a second petition to the General Board of Health in London about the poor sanitation in Haworth. Charlotte Bronte's novel Shirley was published under the pseudonym Currer Bell. Patrick Bronte wrote to the General Board of Health in London asking them to survey the water supply in Haworth. Benjamin Herschel Babbage travelled to Haworth to examine the sanitary condition of the village on behalf of the General Board of Health. Benjamin Herschel Babbage Inspector of the General Board of Health in London opened his investigation on the state of the water supply in Haworth. His report found the sanitation was poor, open sewers coursing down Main St and water leaching from the graveyard into the main source of drinking water. Patrick Bronte wrote: " I have been rather uneasy by information from Mr Nicholls, respecting a path leading through the Church lands to the Mill". "For my part I am free to walk on the moors - but when I go out there alone - everything reminds me of the times when others were with me and then the moors seem a wilderness, featureless, solitary, saddening - My sister Emily had a particular love for them , and there is not a knoll of heather, not a branch of fern, not a young bilberry leaf not a fluttering lark or linnet but reminds me of her." Charlotte Bronte met the Duke of Wellington at the Chapel Royal London. Charlotte Bronte sat for her portrait. She was drawn by the artist George Redmond. “Yesterday I went for the second time to the Crystal Palace. We remained in it about three hours, and I must say I was more struck with it on this occasion than at my first visit. It is a wonderful place – vast, strange, new and impossible to describe. Its grandeur does not consist in one thing, but in the unique assemblage of all things. Whatever human industry has created you find there, from the great compartments filled with railway engines and boilers, with mill machinery in full work, with splendid carriages of all kinds, with harness of every description, to the glass-covered and velvet-spread stands loaded with the most gorgeous work of the goldsmith and silversmith, and the carefully guarded caskets full of real diamonds and pearls worth hundreds of thousands of pounds." Patrick Bronte wrote again to the General Board of Health regarding sanitation in Haworth: "Yet after, tedious delay, they, have, as far as we know done almost nothing - We might have thought that this arose from a press of more urgent business, had it not been, that we have learned from good authority, that their salutatory rules have been adopted, and enforced, in various other places where there was less necessity for them". Charlotte Bronte completed the first draft of her novel "Villette". Charlotte Bronte visited Filey staying at the same lodgings she and Ellen Nussey had stayed after Anne's death. Charlotte went to visit Anne’s grave and discovered a number of errors on the Gravestone, in particular Anne's age, the date on the stone is 28, she was 29 when she died. Arthur Bell Nicholls proposed to Charlotte Bronte. Charlotte informed her father who was not pleased about the marriage proposal. She wrote to Nicholls rejecting him. Charlotte Bronte's novel Villette was published. Nicholls had applied to the SPG for a missionary post in Australia after Charlotte turned down his proposal of marriage. A.B. Nicholls wrote to the Society for the Propagation of the Gospel enquiring whether his application for a missionary posting had been received as he had not had a reply. Revd. A. B. Nicholls was presented with a pocket watch, inside the cover is inscribed: "Presented to the Revd. A. B. Nicholls by the teachers scholars and congregation of St Michael’s Haworth Yorkshire May 25th 1853". Elizabeth Gaskell who wrote "The life of Charlotte Bronte" visited Charlotte Bronte at Haworth. Arthur Bell Nicholls proposed to Charlotte Bronte who accepted. Patrick Bronte wrote a testimonial for William Brown asserting his competence as a sexton. Charlotte Bronte and Arthur Bell Nicholls returned to Haworth from their honeymoon in Ireland. They were married on 29th June 1854. Charlotte Bronte and her husband Arthur Nicholls walked to what is now known as the Bronte waterfalls. Charlotte had wished to see the waterfall in all its glory as heavy rain and melting snow had turned the water into a "perfect torrent". Charlotte Bronte was examined by Dr Mc Turk and was found to be pregnant. Tabitha Ackroyd "Tabby" faithful servant of the Bronte family died aged 85. She did not marry or have children, she is recorded on the 1851 census as "Unmarried". Tabitha Ackroyd "Tabby" faithful servant of the Bronte family was buried at Haworth aged 85. She had died on 17th February 1851. She did not marry or have any children. Charlotte Bronte died at Haworth, she was 38 years of age. Charlotte Bronte was buried in the family vault at Haworth Parish Church. She had died on 31st March aged 38. Patrick Bronte made his own will. Elizabeth Gaskell visited Haworth to meet Patrick Bronte to discuss the biography of Charlotte Bronte. John Brown was buried in the Churchyard. Arthur Nicholls officiated, Patrick Brontë sat with Mrs. Mary Brown and Martha Brown in the Bronte pew. "leaving all authorship on one side, her character as a woman was unusual to the point of being unique. I never heard or read of anyone who was for an instant, or in any respect, to be compared to her. And everything she did and every word she said and wrote bore the impress of this remarkable character." The manuscript of the "Life of Charlotte Bronte" by Elizabeth Gaskell was completed. Patrick Bronte carried out his last marriage service at Haworth church. The "Life of Charlotte Bronte" by Elizabeth Gaskell was published. Charlotte Bronte's previously rejected novel "The Professor" was published. With regard to the statement that Mr Brontë, in his desire to bring up his children simply and heartily, refused to permit them to eat flesh meat he asserts that Nancy Garr alleges that the children had meat daily, and as much of the food as they chose. The early article from which they were restrained was butter, but its want was compensated for by what is known in Yorkshire as "spice-cake," a description of bread which is the staple food at Christmas for all meals but dinner. "I did not know that I had an enemy in the world, much less one who would traduce me before my death. Everything in that book "the biography of his daughter" which relates to my conduct to my family is either false or distorted. I never did commit such acts as are ascribed to me. I stated this in a letter which I sent to Mrs Gaskell, requesting her at the same time to cancel the false statements about me in the next edition of her book. To this I received no other answer than that Mrs Gaskell was unwell, and unable to write." Patrick Bronte died at Haworth. He was 84. Patrick Bronte was buried in the family vault at Haworth Church. He had died on the 7th June aged 84. The auction of Bronte household items took place in Haworth. Arthur Bell Nichols married again. Mr James Ackroyd put up for auction the wood taken from the demolished Bronte Church. According to the report of the sale, the bulk of it did not fetch the price of even ordinary wood, and some of the best oak beams were reserved. It was stated, however, that several pieces had been disposed of at fancy prices previous to the sale. Martha Brown servant of the Brontes died aged 52. Mme Heger died in Brussels. The family ran the Pensionnat Heger, a finishing school in Brussels which Charlotte and Emily Bronte had attended. Mary Taylor close friend of Charlotte Bronte died. The Bronte society was founded in Bradford. The first meeting took place in Bradford Town Hall on Saturday December 16th at 3pm, and was attended by more than 50 people. The first Bronte Museum opened on the upper floor of the Yorkshire Penny Bank at Haworth. The building is now the Tourist Information Centre. Arthur Bell Nicholls husband of Charlotte Bronte died. He was 87. 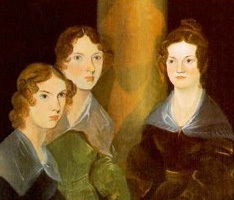 The portrait of Charlotte, Emily and Anne Bronte, painted by Branwell Bronte was exhibited for the first time at the National Portrait Gallery. It had been presumed lost. After Charlotte Bronte died her husband Rev. Nichols took the picture to Ireland. In 1914 it was discovered folded in a cupboard, the creases are visible on the picture. "When, in the late seventies of the last century, it was contemplated to pull down the historic old church at Haworth there was much opposition to the project, and others were even made by wealthy people to build a new church not far away if the old one could be preserved. It was of no avail, and the faculty was obtained from the Bishop of Ripon, and the last service was held in September, 1879. By Christmas the quaint old edifice in which the noted evangelist had ministered for 21 years (1742-63), and the father of the gifted Brontë sisters at a later period for 41 years (1820-61) had been razed to the ground, and the ceremony of foundation stones was performed. What a furore this caused is testified by the older people, who read eagerly what appeared in the correspondence columns of the leading journals of that day now about half a century ago. At that time Bret Harte, the renowned American author and humorist, was consul in Glasgow, and he made a special visit to Haworth and wrote a powerful appeal for the preservation of the church. One wonders what will happen to the Rectory. Will it, after all, become the proud possession of the Brontë Society, and thus be preserved as the headquarters and the Museum of that virile organisation? The present premises are far too small for the priceless things they already possess, and to have the rooms in which the immortal works were written would indeed be a valued possession comparable to Shakespeare's birthplace at Stratford-on-Avon." The Parsonage at Haworth was officially handed over to the Bronte Society. Probably the only living school-fellow of the Brontë sisters, Mr John Rushworth, a retired cartwright of Denholme, Yorks will shortly enter his 96th year. He spent his childhood at Haworth (near Denholme) during the vicariate of the Rev Patrick Brontë, and at the village school which he attended the Rectory children were also pupils. "I knew all the Brontë's," he told a "Daily Chronicle" representative who called upon him in his little cottage in Commercial Street last evening. "Charlotte and her sisters went to school when I did, though I did not see much of them there. The school was only one room and a partition divided boys from girls. "I remember Mr Brontë well. We used to have to go to church every day after lessons, and he would preach to us. But I can tell you it was a surprise when we got to know that Charlotte and Emily Brontë were authoresses. We could not believe it at first." In spite of his age, Mr Rushworth's only infirmity is deafness. He is not teetotal and still enjoys his pipe. "I think I am so well," he said, "because I always drink at gill of milk every day. It's only these last 10 years that I have not been as active as I used to be. Why, at 70 I could jump a six-foot wall." "The manuscript of Charlotte Brontë’s "The Violet" was sold at Sotheby's on Monday for £250. At the foot of the preface is written, "A Book of Rhymes, by Charlotte Brontë, alias the Marquess of Douro-begun November 8, 1830, finished November 14, 1830." In a cavity beneath a stone at the east end of Haworth church is a sealed bottle containing documents and coins of the Christmas of 50 years ago. It was placed there by Mr George Merrall on the occasion of the laying of the foundation-stone of the present church on Christmas Day of 1879, by Mr Michael Merrall, of Lawhouse. That ceremony was the culmination of a memorable year, and followed a bitter controversy over the demolition of the old church of the Brontë's, which aroused tremendous interest and agitation throughout the country. Records of the event show that the ceremony was witnessed by over 1000 people. The rector of Haworth (the Rev J Wade), who had been a central figure in the dispute over the old church, presented Mr Michael Merrall with a silver mallet with which to perform the ceremony. The church was opened in 1881. Thousands of Brontë lovers who make an annual pilgrimage to Far Withens, on the Stanbury Moors, will receive a big shock when they learn that the Brontë Society cannot agree that it is in fact the original of Emily Brontë's "Wuthering Heights." The point arises out of the decision of Keighley Corporation to fence off Far Withens because of danger of the building collapsing, and to leave it to decay. Representatives of the Brontë Society tell me that even if Far Withens is a genuine relic of the Brontë's they have not the necessary funds for its restoration. Recently it has been claimed that the setting for "Wuthering Heights" was an old Hall at Southowram where Emily Brontë was governess, and point is lent to this theory by the presence there of a Gateway and statuettes which are described in the novel. The interior scenes were taken from Ponden Hall, Stanbury-a claim substantiated by chairs and other articles from Ponden Hall, now in the Brontë Museum here, and which are minutely described by Miss Brontë. Mr John Toothill of Haworth better known as "Jack Tooit," whose death took place yesterday at the age of 87 was a notorious practical joker. He was a village barber, and in the days of the penny shave a man with a weeks growth of beard came into his shop and asked if he could have a shave, though he possessed only a halfpenny. "Tooit " solemnly lathered the man, shaved half his face, ran the back of the razor over the remainder of his cheek and then allowed his half shaved customer to go. When the customer discovered his plight he admitted "Tooit " had had the better of him, borrowed a penny from a friend, and went back for a complete shave, which thus cost him three-halfpence. He was always proud of his association with the Rev Patrick Brontë, rector of Haworth and father of the famous novelist sisters, for it was to his father's shop that the rector used to come to be shaved. "Many’s the time I've lathered him," Jack used to say, and he was never tired of recalling those old days. On one occasion when Mr Brontë was under the razor a well-known churchman came into the shop, and finding a large number of customers present he vowed in terms more expressive than polite that he would not have entered if he had known that the shop had been so crowded. Mr Brontë at once rebuked him for his unbecoming language, and said that he ought to read his Bible more. "Nay" said the offender, "I’ve a book at hooam that taks a lot moor hod o’ me than t’Bible." "Oh, and what is that?" Asked Mr Brontë. "Tick book," replied the man to the uproarious delight of the customers. Mr Brontë fully appreciated the local significance of the answer, and gave his parishioner a Florin. James Roosevelt, the son of US President Franklin D. Roosevelt, visited the Parsonage. The Bronte bridge was destroyed by a flash flood. It was rebuilt in 1990. "I am delighted to have been given the opportunity to speak briefly on a subject that has caused me some concern over the past two years. I also want to record my gratitude to my hon. Friend the Minister for replying to the debate: he must have many calls on his time in such a busy Department. For the benefit of those less fortunate hon. Members who do not live in the West Riding, let me begin by explaining what and where Top Withens is. Top Withens, or what remains of it, is a much loved ruin--a sort of last outpost of human endeavour--standing in grand isolation on a vast windswept moor-top above the hamlet of Stanbury, which in turn stands above Haworth. All that is in my constituency. Haworth contains the parsonage, now a museum, which is dedicated to the life and work of the Brontee sisters. Emily Brontee wrote her passionate, haunting book "Wuthering Heights" there, and a family friend, Ellen Nussey, subsequently explained that Emily had had Top Withens in mind when she described the position of Wuthering Heights with its "pure, bracing ventilation". Although there are differences in the architecture of the two buildings, Withens remains a point of pilgrimage for Brontee enthusiasts from around the world, and a focal point for walkers, as it stands yards from the Pennine way national trail." Charlotte Bronte's I've been wandering in the greenwoods, dated 14 December 1829, written when she was just 13 sold at auction for £92,450.